The name Discovery Park reflects this park's theme and special features with a strong emphasis on hands on learning and play, including an area where kids can create their own rivers and dams. 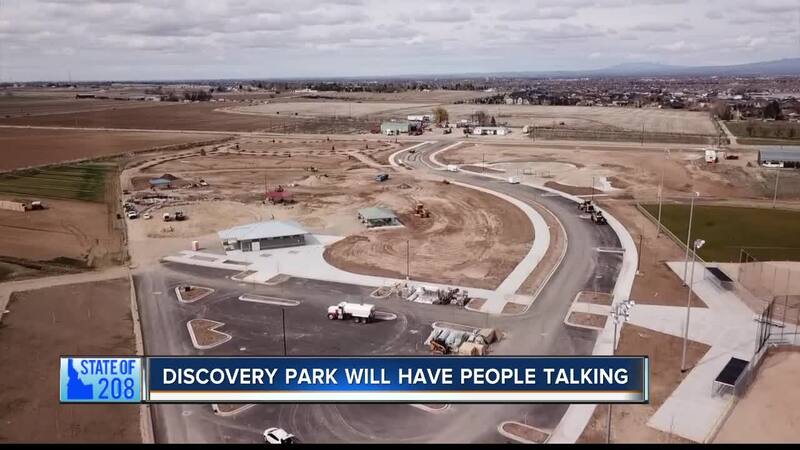 MERIDIAN, Idaho — It's called Discovery park. It will be Meridian's largest and most unique park in their entire system, and this new regional park has been in the works for a long time. The name Discovery Park reflects this park's theme and special features with a strong emphasis on hands on learning and play, including an area where kids can create their own rivers and dams. Steve Siddoway, the City's Parks and Recreation director this has been in the works, since they bought the property ten years ago. "We have to look forward ahead at what's coming, not just this year, and next year, but five or ten years down the road. The growth in south Meridian has triggered the addition of this park," Siddoway said. What a park it will be. The first phrase should be open by mid summer, with other phases to follow. The park will feature interpretive panels depicting Idaho's natural beauty, including a huge climbing wall that will take you up and over to the playground area. The center piece of the climbing wall will be a map of Idaho where kids grab mountains to get to the top. It's not just Idaho's mountains that get kids excited, it's our rivers and streams. So imagine being able to create your own waterways and learn what happens when you dam them up. "If you can envision a water pump here and the water will flow down the channel's high end and then low end and you follow the water right down here where you can build a dam structure and what kid doesn't like to play in sand and water," Siddoway says. Don't forget about the splash pad, zip line, and dog park. "People love their dogs in this community and because of that we have a do park we affectionately call tails and trails," Siddoway says. Get ready, phase one will be ready soon, and so much more is still to come. Discovery park is truly a positive result of our exploding growth.